← Tripping the light fantastic & bringing in the grapes . . . Finally drying out from the huge storms of the past week. Flooded roads and a couple of days without electricity were nothing compared to the loss of life and devastation elsewhere in the area. These pictures taken in Laurens. Writing this post, it occurs to me that the title of the blog, A Year In France,is probably overdue for a change. With the approach of my second year here, perhaps My Life In France might be more appropriate. Since that probably means creating an entirely new blog, it’s one of those things I’ll put off and put off, probably until the third year rolls around. And, on the topic of procrastination–more and more time seems to elapse between these posts. When I first arrived, everything was potential material–radishes from the Super U, laundry, baguettes, I wrote about it all. These days while I often post pictures and observations on Facebook, the act of sitting down to write a longer post seems to require more of an effort. I don’t think it’s because I’ve stopped seeing France with a newcomer’s eyes–almost every day, I’m struck by something that I think would make a good post, rather it’s that I’ve settled into a life here with the sort of day to day routine that requires time spent away from the computer. Still, I hate to let things slip by without recording them, so here are a few snap shots from the past couple of months. A few weeks ago, on the way to Domaine de Cébène, I stopped to take a closer look at the old railway station in Faugeres–I guess it was more than a few weeks ago because the figs were ripe on a tree that seemed to belong to no-one and I couldn’t resist. So after I’d gorged, I poked around the station. Weeds, wind blowing, a haunted feel. I’d like to write that it was Halloween, because that would have been fitting. I peered through the windows, imagining passengers from days gone by. I was so inspired in fact that I came home and started researching the railways of France. Lots of history and story potential there. And so the hours go by–much food for thought, not so much productivity. An interesting website http://www.walkinginfrance.info with a section on disused trailways tracks. While big box stores, fast fast restaurants and shopping malls around the perimeters of French cities leave no doubt that this is the 21st century, life in the villages can sometimes feel like a walk back in time. In Faugéres recently, I saw a traveling hair salon–a bit of the old and new, I suppose. The very dapper barber explained that at one time he had clients in all the surrounding villages and people would line up waiting for a hair cut. Now older clients have died, younger people have cars and the need for his services is dwindling. Soon, he said, he’ll have to look for something else to do. Sitting at my desk a few weeks ago when from the street below my window, the tinny sound of Clementine playing (which, fortunately, served to drown out the voice of my karaoke singing neighbour) and an amplified voice calling “allo, allo . . . ” There was more, but that’s all I understood. I knew though that it was announcing the Thursday market in the village. A small market, sometimes just one stand, but I decided to take a walk anyway. On the fruit stall, what looked like giant apples. I asked. Quince, the man said. I wasn’t quite sure what to do with quince, but I bought one anyway. Then a little stroll through the village and a stop at the butcher’s. I’d only eaten rabbit once before, but I’d been feeling ready for a culinary adventure (a recipe for rabbit with prunes sounded interesting) so I asked if lapin was available. The butcher smiled, disappeared, then returned holding a skinned rabbit by its hind legs. He put it on the scale. “Est-il-possible . . .” I started. “Coupe?” He waved a knife over the rabbit, removed an internal organ and looked at me. I was trying not to look at the rabbit’s head. “Est-il-possible . . .” I started again, then reached into my mental grab bag of French words. “Je voudrais a petit morceau pour deux personnes.” I’d learned to say this in Montpeyroux when confronted with the question of how much I wanted–just enough for two people. He shook his head. It wasn’t possible. The whole rabbit, or nothing. I apologised profusely and wished him a bonne journée. I hope I didn’t ruin his day. The quince, I discovered, was quite delicious baked. A Facebook post from October. It’s a bit of a cliché to say that the little things in life are what happiness is all about, but I’ve just walked back from the village, grinning like an idiot and feeling incredibly happy. Sunday morning and I’m supposed to bring cheese to a gathering tonight. Some supermarkets are open Sunday morning, but not the one closest to my apartment. I’m not sure what will be open in the village, but I go and check things out. In the boulangerie, a enormous pile of gaudy, but festive looking meringues on the counter and a jewel case of tarts and cakes. I buy a small baguette–fig–still warm from the oven. Outside the épicerie, a few men at sitting at white plastic tables drinking coffee. We exchange bonjours. I go inside. The woman behind the counter sees me looking at the vegetables and apologises, they’re all “mal,” she tells me and shrugs. No problem, I’m there for the cheeses and there’s an impressive display. I buy several pieces–Cantal, one with a blue vein running through the middle, another the colour of caramel. She wraps each piece in white paper, they’re all produced in this area she tells me. I should have had her mark the names on the packages, but that’s ok. There’s a drift of mist over the foothills, the air is warm for mid October, a cloud of small birds rise up from the field, chirping and chattering. I love living here. So now it’s December, Joe arrived for a visit last week. 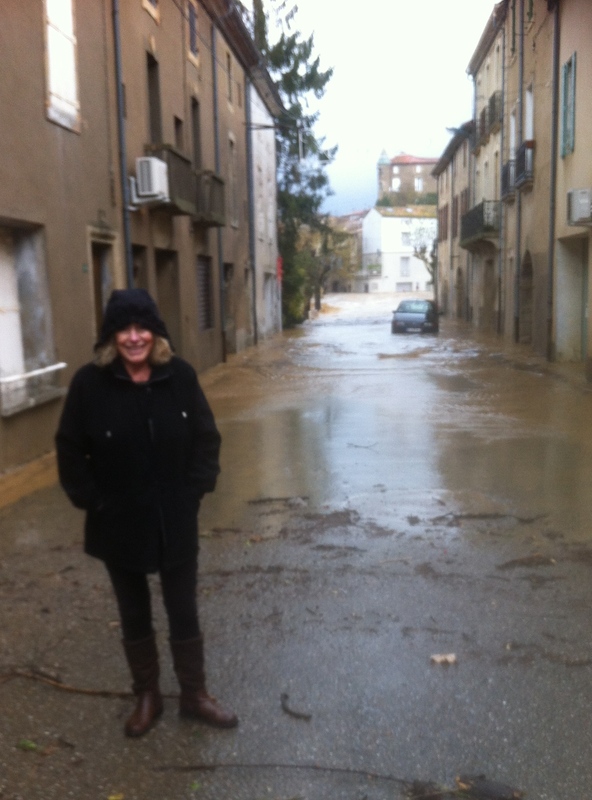 I picked him up in Barcelona and we took a meandering drive back, stopping en route in Ceret. In a couple of weeks, we’re off to Poland where the weather might be even less hospitable! Loved reading this blog and seeing the photos. Sure makes one living in the USA realize how young a nation she is. Love the narrow streets, tall buildings, and the open markets. I can see why you love living there. Merry Christmas from the Western Mountains of Maine.